Be the first to share your favorite memory, photo or story of Alexandra. This memorial page is dedicated for family, friends and future generations to celebrate the life of their loved one. Alexandra Huston Fuller, at age 94, passed away on January 21st, at 11:00 pm, at her family’s Willow Brook Farms, in her own bed, under the waning light of the 2019, wolf blood moon. She was born in 1924, in New York City at New York Woman’s Hospital and she arrived into the “Roaring 20’s”. She was the daughter of Isabelle D. Huston and Arthur T. Huston, both deceased. 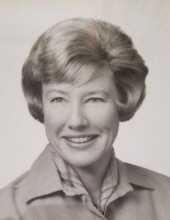 She spent much of her early life in Sea Island, Georgia, where she and her sister, Judy graduated from Glynn Academy in Brunswick, Georgia, then taught Kindergarten and 1st Grade on Sea Island. She attended Bucknell University and her dedication to grammar and sentence construction made her a reliable professional for editing of all the documents that her adult children submitted to her. Alexandra was an avid tennis player and swimmer. In her youth she and her sister, Judy, performed in synchronized swimming at the Sea Island Beach Club. She and Judy volunteered at the Home Front Coast Guard Station on St Simons Island, performing civic duties to keep watch for German subs and destroyers off our South Eastern shores during WWII. She was beautiful and often modeled bathing suits, appearing in Vogue Magazine. Alexandra married C. Thomas Fuller (now deceased) of Catasauqua, Pennsylvania on June 12, 1946 and moved to Willow Brook Farms, where she lived until her death. Tom and Alex Fuller had three children, Holly, Peter, and Vicki. Alexandra was a member of St. Stephen’s Episcopal Church, where she sang in the choir during her years in the Lehigh Valley. She served as Secretary of St. Stephen’s (Anglican Foundation of the Lehigh Valley Foundation). She was one of the founding members of the Society of the Arts of the Allentown Art Museum. Alexandra was gracious, elegant and a classic “Lady” of her era. She was always the voice of reason. She taught her children to be kind, inclusive and set an example by her life of dignified integrity. Children - Holly McLain - Carbondale, CO; Peter Fuller – Catasauqua, PA; and Victoria Fuller – Chicago, IL, Grandchildren – Travis McLain – Aspen, CO; Afton McLain – Aspen, CO; Nicole Fuller – Rogue River, OR; Zach Fuller – Catasauqua, PA; Jeremiah Fuller – Miami Beach, FL. Sincere thanks to Father Joe Falzone, who has been our family’s loyal spiritual guide and confidant. Submitted by Holly Fuller McLain – For my loving Mother. To plant a tree in memory of Alexandra H. Fuller, please visit our Tribute Store. "Email Address" would like to share the life celebration of Alexandra H. Fuller. Click on the "link" to go to share a favorite memory or leave a condolence message for the family.